One of the most important aspects of any lightweight sports car is the ride and handling, and Lotus lead the way. The flexible setup of the Elise, Exige, 2-Eleven, and Evora gives an excellent range of adjustment opportunities to get the best from the car, depending of course on your intended purpose. We have geometry specifications for all Lotus vehicles from factory standard settings to more aggressive track day and race settings. Many customers are surprised at just how much difference they see in their road-going cars when the geometry is correctly set. Our state-of-the-art 4-wheel alignment system allows us to quickly establish your current geometry and identify problem areas quickly and effectively. Modifications to geometry or wheel alignment can be made quickly and accurately saving you both time and money. Check the current state of your geometry and wheel alignment with specified pre-load weights. Full print-out is provided. No adjustments are made during this check. 4-Wheel Alignment & Geo but no ride height adjustment. Includes adjustments to camber, front and rear toe as required to bring car into spec. No caster adjustment or ride height. This should be carried out annually or after impacts (e.g. pot holes) or frequent track days. Rear toe and front tracking alignment. Includes adjustments to front track and rear toe to bring into required specification. No camber or caster adjustments. An essential maintenance job if tyre wear becomes uneven. Set Ride Height, Adjust Geo & Wheel Alignment. Includes ride height adjustment (sports suspension only), adjustments to camber, caster, front and rear toe as required to bring car into spec. If lowering more than 5mm from standard we recommend adjusting the steering rack height to help bring bump-steer back into spec. Adjust Steering Rack Height (if required). If you are more serious about using your car on the track, we can fine-tune your suspension and set the weight distribution in your car as required. Using a flat floor and state-of-the-art wireless weighing technology, we can set your adjustable suspension to give you a more balanced car, which will improve ride and handling on the track. Alongside our technical expertise we have a number of products that will allow you to upgrade your original or worn-out suspension components. From complete suspension kits of springs and dampers to toe-link and brace-bar kits, anti-roll-bar kits and more – we have all the parts you need to create the perfect handling Lotus. We have partnered with JRZ to introduce and develop complete suspension kits for all models and years of Lotus Elise, Exige, 2-Eleven and Evora models. The range starts with single-adjustable road and track kits through to 3-way adjustable kits which are suitable for the more hard-core track day user and racers. Nitron Racing springs and dampers are also available to order. 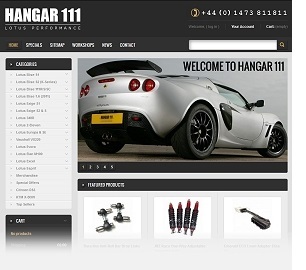 All Hangar 111′s race cars feature the JRZ One-Way Adjustable Race spring and damper kit. For more information on our suspension setup services, please contact us by telephone or email.